Tripp Lite's Hospital Grade 700VA UPS System offer medical-grade UPS protection with built-in Line-interactive Voltage Regulation, Intelligent Monitoring and Unattended Shutdown capability with less than 300 microamps leakage current for the UPS and all connected equipment. Built-in Isolation Transformer with faraday shield removes common mode noise while maintaining full AC surge suppression in all modes. 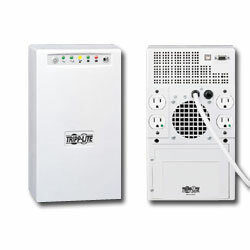 700 VA of battery backup allows you to work through short blackouts or safely shut down during longer ones. UL2601-1 listing provides ultimate safety and reliability for computer equipment used in patient care areas and sensitive laboratory test equipment. Ideal UPS protection for point of care solutions, telemedicine, nurse's stations, wireless communications systems, electronic prescribing applications, medical imaging and laboratory equipment. NOT RECOMMENDED FOR LIFE SUPPORT APPLICATIONS!!! UL2601-1 listing provides ultimate safety and reliability for computer equipment used in patient care areas and sensitive laboratory test equipment.